This responsive, friendly and innovative ideology is what started the business in 1987; and it is this customer orientated service that has since seen Tim Gray, son of the late Brian and also the Chairman of the UK Sheet Plant Association, drive the company to its modern-day industry-leading position. Of course, investment in both staff and technology has been instrumental to the on-going success of Dairi-Pak, a success that will certainly be taken to the next level with the arrival of a DYSS X5-1625T digital cutting table from AG/CAD Limited. 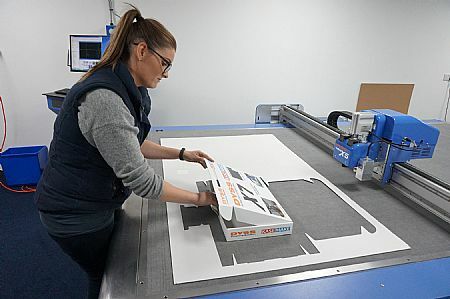 Moving into its 30th year of business, the 48 employee corrugated sheet company has diversified down the decades from its roots in the dairy industry into the design, print and production of boxes, cases, fitments and pads, PoS and much more for all sectors. With a client list that includes some of the world’s most famous brands, Dairi-Pak has invested heavily in machinery and factory expansions throughout its history. The investment strategy in the early years majored on good second-hand machinery, but more recently investment has been in new high volume machines. 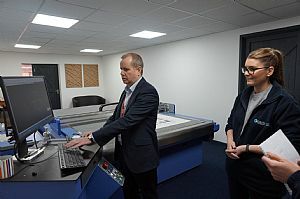 These in-line case makers and automatic die cutting machines are now well utilised, helping to make a return on Dairi-Pak’s investment in CorrBoard and at Platt Mill (the home of Dairi-Pak). Dairi-Pak has always been strong in design and has had great success using KASEMAKE and an AG/CAD KM sample cutting table for the last decade. 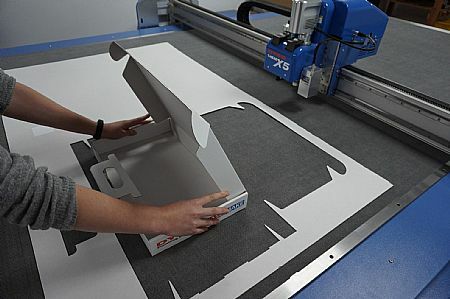 The company has built a reputation for bringing new projects to fruition to very tight timescales enhancing Dairi-Pak’s reputation as a leading bespoke packaging supplier. However, in 2017, the investment program accelerated further with the arrival of a new ink kitchen, spectrophotometer, a new 4-colour Martin case-maker and a DYSS X5-1625T digital cutter from AG/CAD to replace the previous KM sample table. As the company has grown, more and more demands were being placed on the original KM cutter and the company found a bottleneck with the production of prototypes, samples and short run work. The simple route to resolving the issue was to invest in a new, ultrafast digital cutter and once again, AG/CAD had the solution. 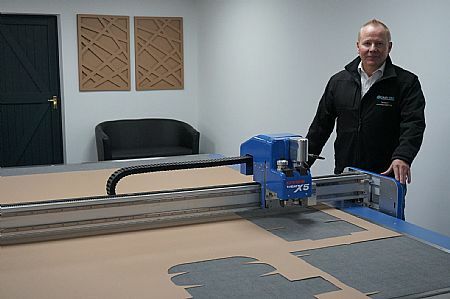 Alluding to the selection of a new cutting table, Dairi-Pak’s Operations Director, Mr Ian Ford recalls: “We recognised the KM machine was relatively slow, the bed size was restrictive to our ambitions and the material it could handle was mainly limited to single wall corrugated sheets. As a business, we have evolved to processing more twin-wall corrugated materials. Dairi-Pak specified the DYSS X5-1625T with a large work area of 1.6m by 2.5m, ideal for typical sheet plant board sizes. Also contributing to the decision was the clever K-CUT camera system that enables accurate cutting of printed samples when required. Dairi-Pak opted for the print register camera as an additional feature to assist the production of full colour mock up’s and small runs or even individually personalised, digitally printed boxes and PoS units. “A new sample room has been custom built to accommodate the new DYSS X5 cutter. This will further streamline the process of producing small volume production runs. The space this has freed up is becoming a brand hub; a relaxed space full of inspiration and examples of packaging where customers will meet with our designers and sales team to develop ideas before they are produced on the DYSS”. Mr Ford continues: "The X5 is a massive leap forward from our old machine, cutting all our substrates up to BC at high speed and with excellent quality. The creasing in particular was a revelation, with none of the typical liner cracking along flute direction and yet with vastly better defined creases, both with and cross flute." “In a typical week, we could be producing hundreds of samples, so having a cutting machine that is several times faster than its predecessor, certainly alleviates pressure and quality is massively improved too." Managing Director of Dairi-Pak and Chairman of the UK Sheet Plant Association, Tim Gray, has always been forward thinking and recognised early on the industry trend for short run production of plain and printed packs to complement the traditional higher volume die-cut runs. Mentioning the DYSS machine from AG/CAD, Mr Gray says: "With the high speed of the X5 we can see that it has the capability to be used as more than just a sample cutter and is allowing us to explore the possibilities of short run, die-less production as we go forward".